The area beyond the atmosphere surrounding our planet is what we call space. Space is black and full of twinkling stars. Space has no air, and humans cannot survive in the area beyond our planet because we need air to live. If you are in space, you could scream and scream but no one would ever hear it. No one will hear your call for help because space is airless and a vacuum. Sound is unable to travel within a vacuum, which is why your voice will not carry sound in space. Your preschool class can explore the boundaries of space and learn more about our universe. They can learn about the stars, the moon and the sun. They can create fun crafts regarding our planet and the space surrounding it. You can read the book titled What’s Out There? : A Book about Space by Lynn Wilson. This book will introduce your students to different concepts reiterated by the crafts. They can learn about the planets, the sun, the moon, the stars and even asteroids. 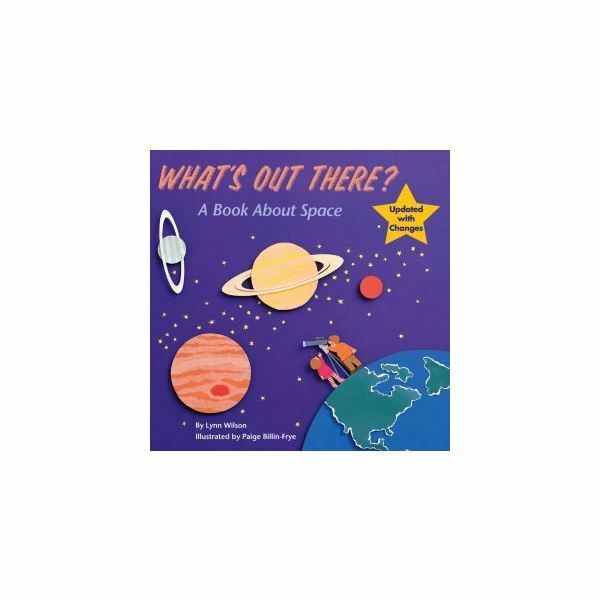 This book about space will bring the concepts to them in simple, everyday language that is both understandable and intriguing. This may be the first time many of them have ever heard about these concepts. The book’s illustrations are plain and simple and great for the preschool age group. You can teach them the basics on space and solar systems. Prior Knowledge – If possible, have a colorful illustration or poster of our solar system. Go over the basic concepts such as the stars, the moon, the planets and earth. Explain to them that the earth is always moving underneath them. Explain to them the earth revolves around or orbits the sun. Explain the sun is the center of the solar system and that all planets orbit around it. Discussion – Once you have read the book to the children, have them talk about the book. This is a good time for a question and answer session on the book and the illustrations of the solar system. You can ask them if they have any questions about our solar system or space. Have one child show you where the sun is. Have another child show you a star, and another one can show you where the earth is. Materials: You will need construction paper, glowing markers, scissors, glue and large glitter flakes. Instructions: Use black or dark blue construction paper for the background of the picture. Draw and cut out the sun, moon and earth from a piece of construction paper. Using the glue, make squiggly lines on the background piece of construction paper. Sprinkle glitter all over this background. Glue the sun, moon and earth on the paper according to their positions in the solar system. Materials: You will need to collect paper bags, scissors, glitter or foil, glue and markers. Instructions: Cut the paper bag so that it rests on the child’s shoulders. Cut out large squares on the front and each side of the paper bag. Allow the children to decorate the helmets with glitter or foil. Materials: Collect two 2-liter plastic soda bottles for each child, kite string, foil or glitter and glue. Instructions: Glue and tie both the soda bottles together side by side. Allow the children to use foil or glitter to decorate their oxygen tanks. Materials: Collect Styrofoam balls and aluminum foil. Instructions: Cover each ball with aluminum foil. Have the children wear their space gear and, as a class and hunt for moon rocks that you have hidden either in the classroom or outside. Assessment: Orally quiz the children on what they have learned. Ask them questions that will review what they have learned. Talk to them a little more in-depth about the first moonwalk. Talk to them about rocket ships; tell them that is how the astronauts were able to go to the moon. In conclusion, the children will be more enlightened on the topic of space and our solar system. They will be more familiar with how the astronauts walked the moon and collected moon rocks. This space theme for Pre-K children is a neat way to introduce science and the planets to preschoolers.